Last night, Samsung launched the phone they hope will overtake the iPhone worldwide, the Galaxy S4. Their launch event was in direct contrast to Apple’s launch events. No man in jeans and polo neck cooly talking about what the phone does to rapturous applause. 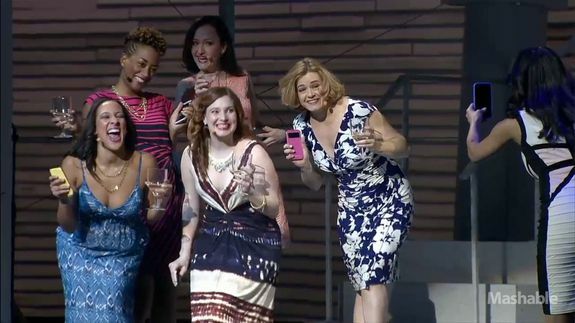 Instead, Samsung put on a full Broadway show of hammy characters acting out a variety of situations you might use the S4’s new features in, from asking directions while travelling in China to taking photos of your daughter’s ballet performance. It really was show, not tell. I thought it was hilariously cheesy, but still great fun. It also got me thinking. How often do charities tell people how they change lives instead of actually showing them? How often do you use paragraphs of text you wrote over a 1 minute audio clip of someone you’ve helped describing the impact on their lives? Look at this page on Macmillan’s website. Will a potential donor or volunteer be more inspired to help after four minutes spent watching the video, or four minutes reading the text on the rest of the page?